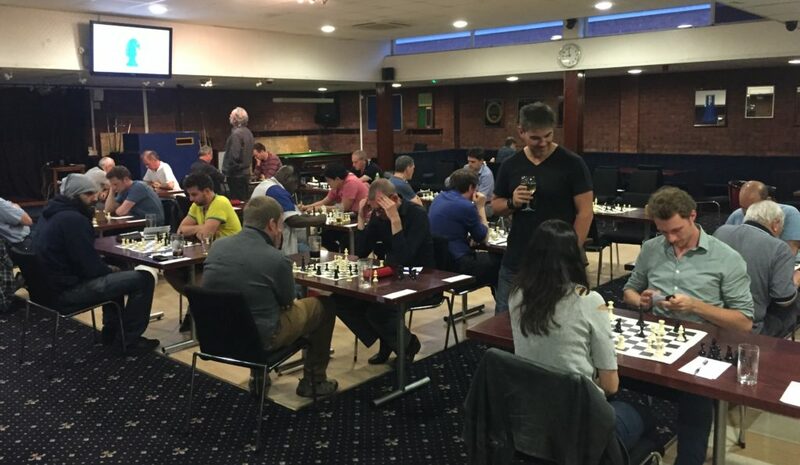 A trio of Hammers took part in the recent BBCA Rapidplay on 11th November, and the results were very encouraging! 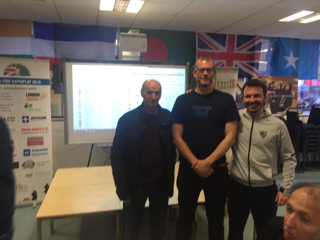 Chris and Kostis both took part in the major section, with our Wily Chairman, Bajrush, playing in the Open (no grade limit!) section. 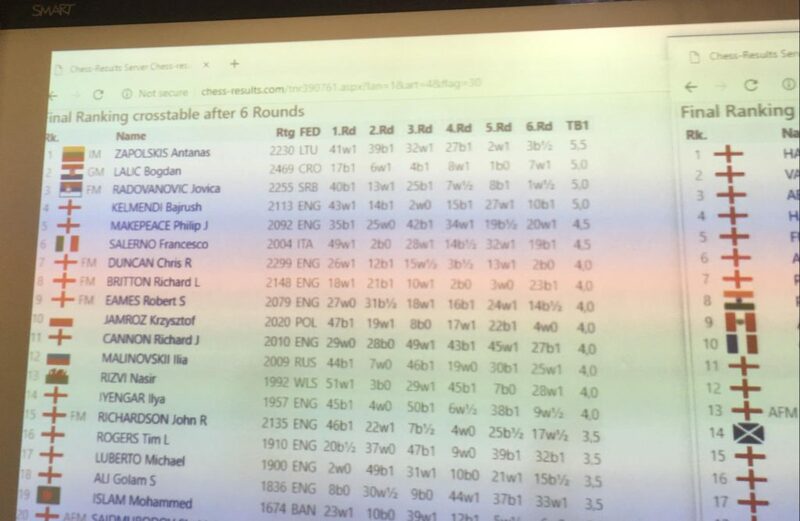 Kostis came away with 2.5 points out of 6 – a solid result. Chris bettered that slightly, with 3 points from 6. But the performance of the day goes to Bajrush, with a whopping 5 out of 6, and a share of 2nd place! Black to play. Bajrush gives his thoughts: “I think I have a winning position, but miscalculated the next move. Black played Bd2, the only move to save him losing the game on the next move (Qg8+). 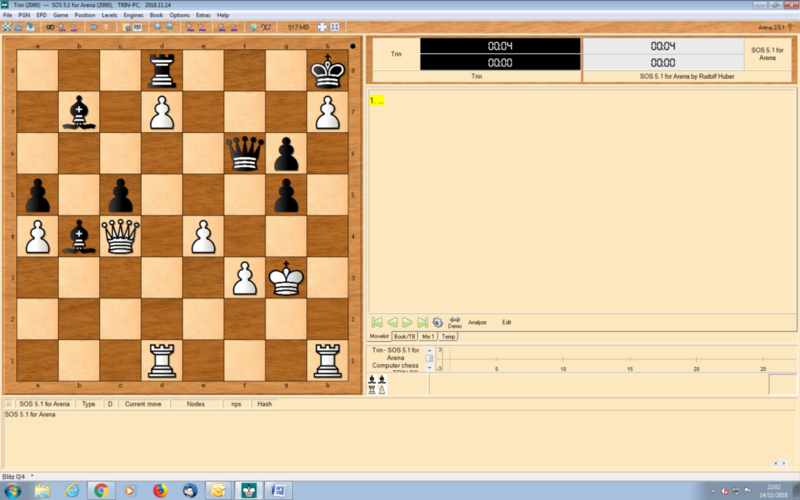 After, I should play Kg2, but instead played Qa2 and ended up losing”. Still, Bajrush ended up sharing 2nd prize with a GM and an IM! Not a bad performance at all!! Captain Robin reports from the front line…. Our first match got off to a shaky start with a 4-1 defeat, and one adjournment, against the very strong Wimbledon team. Nadhmi came up against a 161 player, and played courageously up to the very end. Yazhou on board 5 adjourned with a possible slight advantage. We wait to see how that goes! Back ’63 a young man called Robert Zimmerman captured for an entire generation the scent of change and hope that was in the air. He was Bob Dylan and the rest is history. Nowhere has this progress been more forcibly demonstrated than the Thames Valley League. 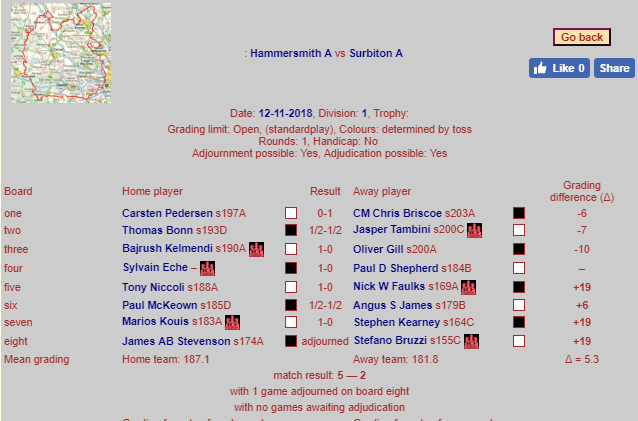 On Monday night Hammer took on one of the perennial powerhouses of the First division – Surbiton A. Hammer have never beaten Surbiton A – last season we got a draw when some player called Clueless salvaged a draw in a murky adjourned game. Indeed, your correspondent can vividly recall a 7.5-0.5 mauling the Hammer crew took 20 months ago that was really traumatic at the time. Hammer were light years away from ever achieving parity, let alone victory. However, this season Hammer have started at a pace in the Thames Valley League – as of Monday night, before the Surbiton encounter, we were 3 and 0. The match would prove how far along the road we have come. First thing – we won. We won handsomely. However, what strikes me is the change in our team line-up. Only Carsten, Bajrush and Marios played in the massacre 20 months ago. Thomas, Sylvain, Tony, Paul and Jim have all joined the Hammer family since that 7.5-0.5 thrashing and hence do not bear the scars of that bruising encounter. Yep, not only the times are a changing, but the personnel definitely are as well. Enough musings. To the games. In board order, Carsten had yet another OTB no quarter given match-up with Chris Briscoe. I would love to know how many times they have played each other. Methinks it is up there with Karpov-Kasparov numbers. The one thing these games are not, and that is boring. It always seems to be primeval chess. Carsten is probably the most correct Hammer player I know but something happens to him when he runs into Chris. The inner Viking takes over. This was a no holds-barred game with kings on an open-board with heavy artillery raining down. It was tightrope stuff with the result possibly going to either player. In the end Chris manoeuvred his black bishop to f3 to give a check, putting it en-prise, and this seemed with time ticking down to throw the Great Dane. A few moves later Carsten resigned in a position where he was one move away from delivering the coup-de-grace himself. Hammer down 0-1. Board three was possibly the game of the evening – our Wily Chairman Bajrush playing white against another 200-rated player. Yep, the patented Wily opening variation got another punt – but astonishingly he introduced a novelty – he actually castled! – which I thought was against the entire spirit of the variation. It was a very exciting encounter with white’s thematic c5! Making space for his bishop on c4 being a highlight. The whole game is given below for your enjoyment. Nobody plays chess like Wily! Board 4 brought our newest newbie Sylvain to the fore – I must say this was a game of warfare that encompassed the whole board – it was brutal and complicated. There were tactics galore accompanied by deep strategy – it gave me a headache just looking at it. However, the finish was prosaic – white in desperation had launched a speculative kingside attack rather than just accept a totally passive position. Sylvain seized his moment by taking a knight with his Queen forcing a recapture with the white Queen and then playing Nf2+ forking the Queen – just very classy. I hereby nickname him Aramis! Next up was Paul McK, the Prof, who deplores the Slow Play format and let it be said is fairly vocal about it. However, I do share his view that it should be confined to the dustbin of history. I have to confess I did not see much of the game but there looked like a lot of manoeuvring and the draw was agreed in one of those positions that would please the detractors of the current Carlsen and Caruana WCC match. Hammer at 4-2 up and guaranteed at least a draw. Next to the plate was Zeus – Marios had uncertain form to the end of last season due to a huge chess workload. 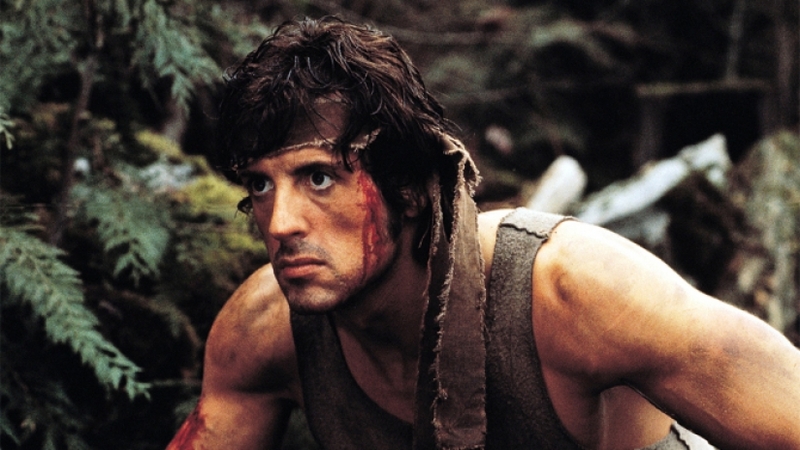 However, with a new career, a lack of beard and an uptick in sartorial elegance he is returning to his best form. The game below is him at his best although he unnecessarily berated himself for missing 18. Nd5! – the good news for Hammer is Zeus is back. It is always good to have the Gods on your side. Hammer past the winning post at 5-2. Our first ever win over Surbiton A. Cue fireworks, music, ticker-tape parade and raucous celebrations. But hold your horses – Jim “El Loco” Stevenson still had to check-in. All eyes turned to our LL Hammer 1 captain playing a slow-play finish game where he held the upper-hand. Now my knowledge of El Loco’s games is filled with Kings Gambits, with tactics and strategy in perfect harmony. This was not one of those games. This was a drudge and a sludge affair where there were no tactics, just the heavy sound of positional moves. Jim had won a pawn in a position where there were two rooks vs two rooks and an opponent intent on just making the sealed move point. Jim was striving to convert when the adjournment came – fortunately his sealed move means he is +3 according to the uber brain, Stockfish. We expect good news shortly. Hammer has come of age!!! A great Hammer night, and many congratulations to Captain Wily and the crew. Back With a Bang in London Division 2! 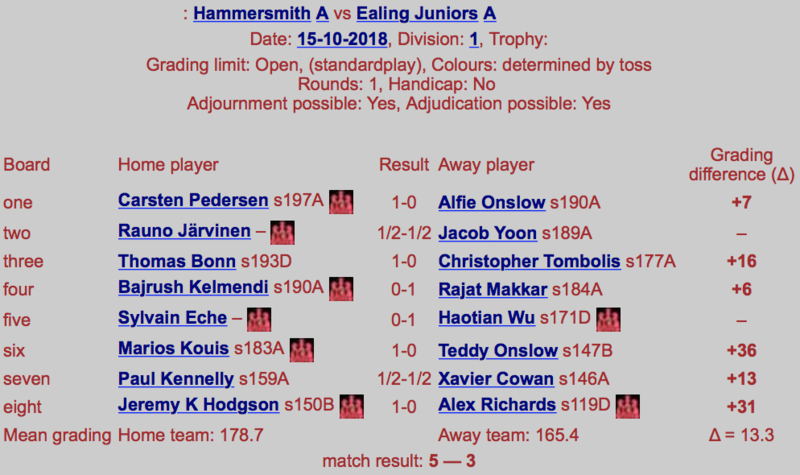 Hammersmith’s keenly anticipated London League Division 2 odyssey got off to an encouraging start with a comfortable 7.5-2.5 win over East Ham. Every member of the team looked focused and played with great determination to squeeze the maximum from every move. In the end our greater strength in depth prevailed. I was delighted to have Alexander and Nadhmi debuting on the lower boards. Both played excellent games and looked like seasoned veterans. The future of the club is in good hands with young guys like this coming through. Carsten has kindly provided some excellent notes to his fine win on top board, which is well worth serious study – see below. Thomas and Bajrush seemed to win very comfortably on 2 and 3. 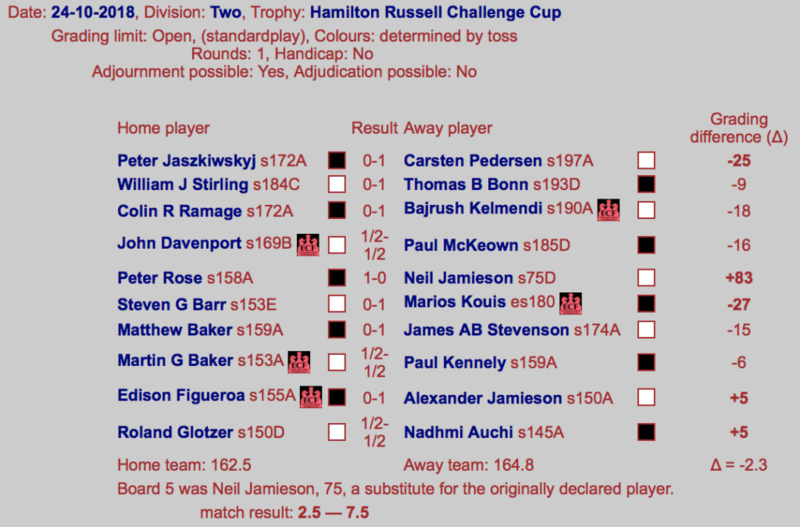 Paul rose from his sickbed to force his opponent to defend doggedly for the three hours to secure a draw on board 4. Unfortunately a last minute emergency at work meant Chris had to pull out, but Neil sportingly stepped in on board 5, 40 mins down on the clock and out graded by some 80 points, he put up a tremendous battle and just missed a deserved draw at the end. Marios, on 6, played a King’s Indian Defence with panache, his king side attack breaking through neatly. I played an enjoyable hack on 7, though Stockfish was quick to point out various improvements for both players. Paul K faced a particularly solid opponent on board 8, finally wending his way through a tricky endgame to secure a draw. On 9, Alexander played a very well controlled, positionally strong game to down his experienced opponent. On 10, Nadhmi did likewise to secure a well earned draw with a higher rated opponent. It will be a long hard season ahead, no doubt with many ups and downs, but if the team battles like this all season, hopefully we won’t be too far away in the battle for the coveted promotion spots to Division 1. “The setup with h3 & Be3 is recommended by John Shaw in his recent 1. e4 repertoire book, and I’d resolved that if I got the chance I’d play it with white, as I’m likely to sooner or later get it with black! However, when we actually got there I realised I couldn’t remember anything about it! Shows recommendation is based on playing 14. 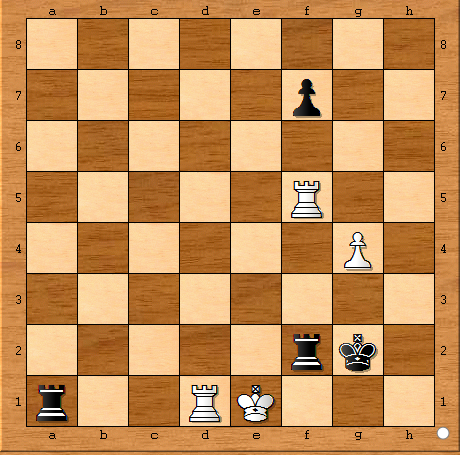 Re1 but instead we followed the old mainline for a few moves until blacks 16…h6? (Berg* continues: 16….Bh5 17. Nf3, Bxf3 =, on Paul K’s preferred 14… Rae8 (“the old move”) he suggests 15. a3 with a small white advantage). Black’s h6 is a serious positional mistake, with e6 covered the Knights job on g5 is done and it needs to be redirected to e5 anyway, so spending a tempo on chasing it there does not make sense, especially as it also seriously weakens the b1-h7 diagonal. Essentially the rest of the game centres around white trying to exploit this, assisted by black misplacing his pieces in a failed attempt to put pressure on f4 & g3 with Nh5 and Qh4. 29. Qxg7 was played with the flag hanging only because I’d seen 30. Bh4, when I expected 30… Qxh4 31. Rxd7+!, Kxd7 32. Qxf7+, Qe7, when I assumed there would be something. While my opponent was thinking I noticed 33. Ba2 and white picks up a second pawn. After Ke8 – which I had not considered at all – I had to make sure I’d not messed up. Stockfish points out the incredible 31. Qh8+ Rf8 32. fxe6 Rxh8 33. exd7# which I was nowhere near seeing. *Emmanuel Berg, in vol.3 of his quality chess series on the French. 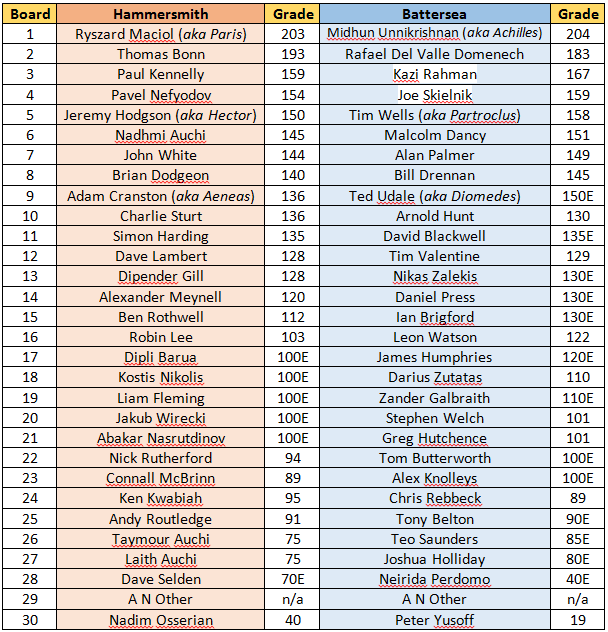 Author HammerPosted on October 30, 2018 Categories Club Updates, Games2 Comments on Back With a Bang in London Division 2! October has been a rip-roaring start to the Season at Hammersmith. We follow with a bunch of write-ups, reporting some fantastic results for the club – read on! Yazhou dropped a couple of pawns in his game, which proved decisive in the endgame, where he succumbed to a defeat. Dipli played very well to win a piece in the middle-game, putting Hammer 2-1 up by the 30 move time control. There’s a very good atmosphere in the Thames Valley Camp at the moment, with Hammer riding high on 3 wins from 3 as we compete in the top tier of the league setup. 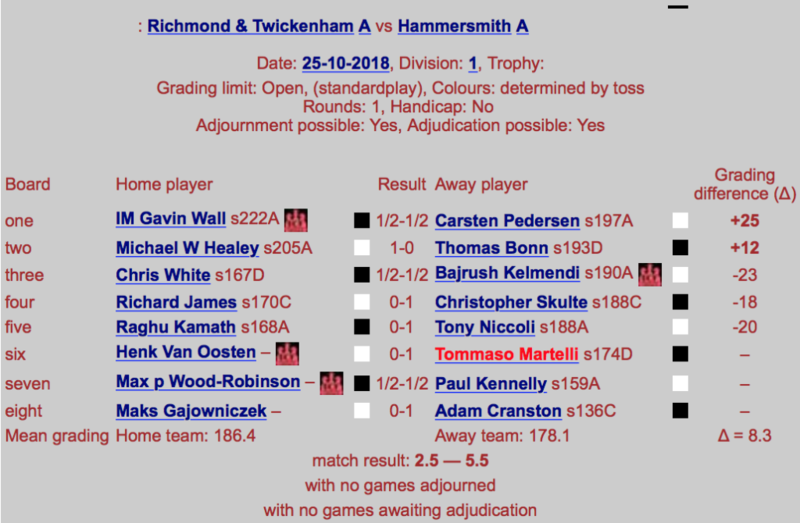 Those last two away results are particularly pleasing – especially the result at Richmond, against a side that out graded us, and included Carsten managing a draw against IM Gavin Wall – brilliant result. Tonight sees our Middlesex 3 side take on the mighty West London, for bragging rights down this end of the Piccadilly Line! Hammersmith Deux’s second match in London Division 4 pitched us against Lewisham, an opportunity to try and score a repeat of our most impressive performance from last season as we took down the big dogs from Sarf-East London. A really tough match. I have to admit being a little surprised by the strength of their team, not least by how far down the board-order they were able to keep churning out 150+ players! I fancy they’ll be in the mix at the top of the table at the end of the season. Full credit to our 1-2-3 of Paul, Sheikh and Nadhmi who secured solid draws against their higher-graded opponents. Particularly well done to Paul who kept things together following some general silliness that crept over from another match entirely! 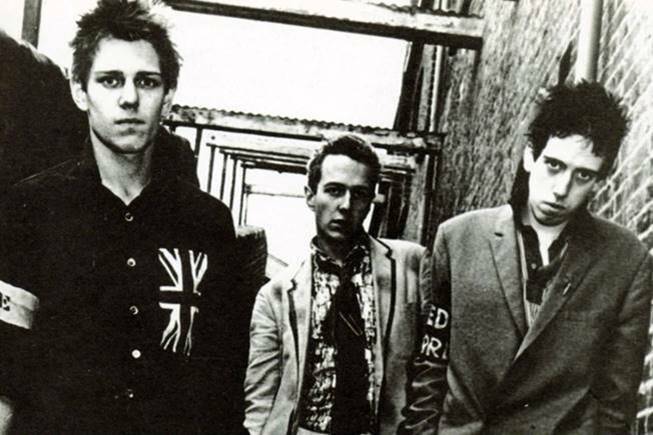 John managed to hold his nerve, seemingly coping with The Clash occurring in his peripheral vision, and ran out the clear winner following a blunder at a crucial moment. The match was technically adjourned but the resignation came shortly before they were forced to reconvene. It was difficult to keep track of some of the games, but I’ve tracked down a couple of PGNs to keep you entertained. The gauntlet has been thrown down, and Hammer have answered. 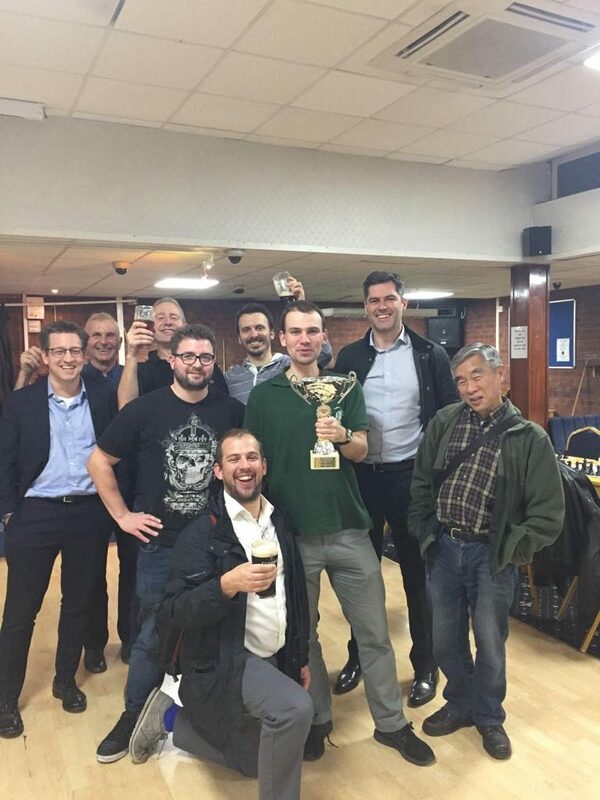 Just over two years ago the noisy neighbours – Battersea Chess Club – challenged Hammer to a mass-board match. The first “El Chessico” match was on, and the ranks of Hammer were mustered. Naturally, Hammer won the first match played in SW11 and drew the second in our Summer home, The Albion. One of the unintended consequences of this was the launch of the Summer League. It has also led to a healthy over-the-board and social media rivalry as well – and let’s not forget the friendship aspect (or should we?). So…. After much debate with Battersea and after receiving the full endorsement of your Hammer Committee, it has been decided to make this an annual event, with a serious trophy. The unique aspect of this challenge match is that it’s literally club-against-club. It will be a match played over at least thirty boards at the home of Battersea. It will be mega, it will be awesome.. it will be EPIC! The event is to be held on Tuesday 6th November 2018. 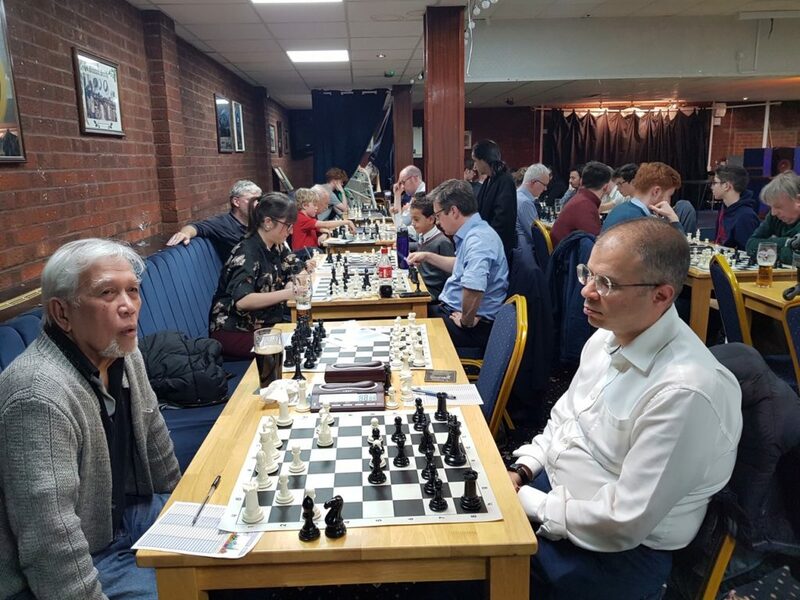 This is the best chess club in West London, taking on the best club in South-West London (they don’t have much competition, admittedly). Who will come out on top, not only securing the trophy, but most importantly at least 12 months of bragging rights. No true Hammer can turn down the opportunity to put one over the noisy neighbours, surely?? With over 70 members in the Hammer ranks, places will be limited. The closing date for expressing interest is the 25th October. It will be a ‘friendly’ match, but games will be rated. Hammers arise, and assemble – the call to arms is made. The honour of Hammer is at stake! Sparks were set to fly in our opening match-up as Hammer were pitted against Hammer, in a no-holds barred grudge match to kick off another great season of chess. Dipender’s Hammer 3 team (lead in his absence by the tactful Dave Lambert, while Dipender was sunning himself on a beach in Greece) were pitted against the Hammer 4 team captained by Wyatt in the third Middlesex League. The 4th team was outgunned in every matchup and looking to take first blood straight away with a no-show on board 7, when Abakar bravely stepped up at the last minute to his first shootout for the club. Needless to say he was off guard and quickly thrown by one of the formidable Auchi trio, but he showed true Hammer spirit and will be a valuable asset in the future Hammer arsenal. The only draw of the evening came on board 5 as old-hand Dave took on young-gun Kostis. In truth, it wasn’t a classic. Dave emerged from the opening with the slightest of edges but he couldn’t force any meaningful concessions, and the game fizzled out into a straight pawn vs. pawn endgame. A creditable result for Kostis who ended the match with the initiative on his debut. 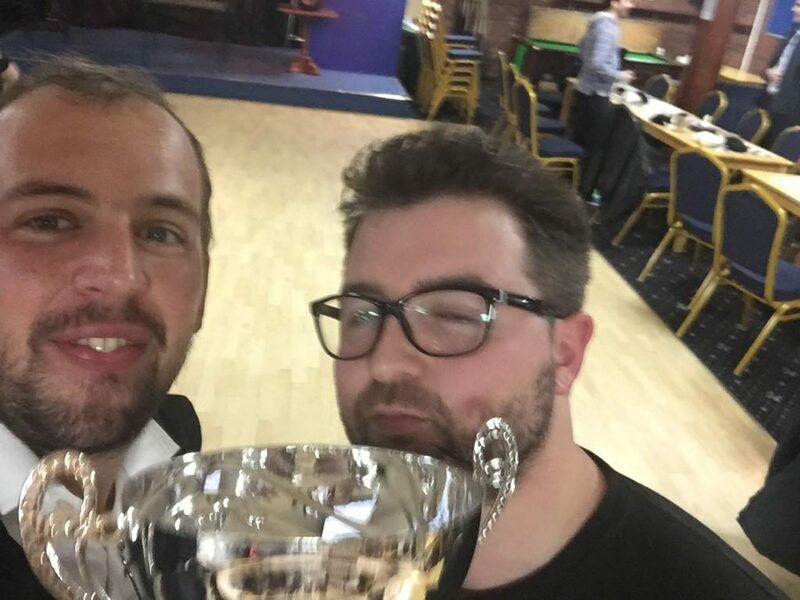 However, the upset of the night came from our very own recently-crowned most improved player, Andrew Macleod, who successfully turned giant-killer in taking down Brian. What a great result from the promising young talent! After the dust settled and the night was over, the under dogs were unable to cause enough of an upset and the stronger Hammer 3 team came out victorious, with bragging rights to boot. With a rematch already scheduled for the end of November, Hammer 4 has time to regroup and rethink their strategy in order to prove themselves as formidable contenders for the top spot. Coming up next week, another Hammer v Hammer grudge match beckons, with Ben’s London 3 team playing Dave’s London 2 squad. Stay tuned! It’s been a couple of weeks, so here we go again! Dipender takes the prize for last week’s puzzle, with his second bite at the cherry – well done Dipender! Taken from a match in 1976, the finish was produced by 15yr old prodigy, Maia Chiburdanidze, on her way to becoming world champion. It all kicks off on September 24th at the home of chess (aka Lytton Hall), with our two teams in Middlesex Div 3 facing off. We then have a crazy busy October featuring 17 games! This is followed by a steady flow of games in the run up to Christmas (don’t forget about the London Chess Classic in December! 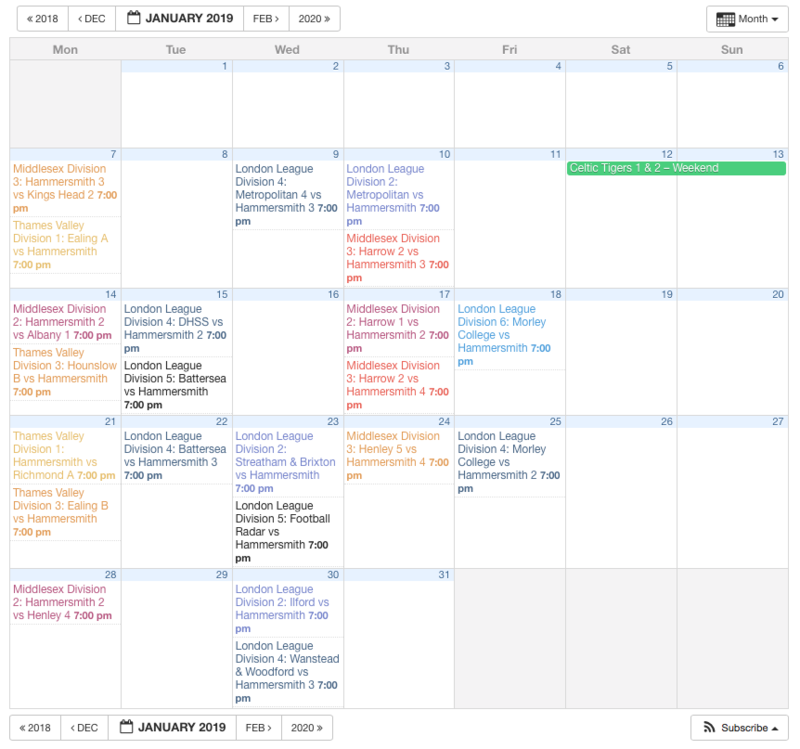 ), and then back with a bang for 22 games in January, with the following three months also averaging 20 games a piece! Things slow down towards the Summer, with our current final (and 136th) fixture in early June. It is going to be a mad one! Please ensure you familiarise yourself with our fixtures & the games you’re likely to be playing – our team Captains should have reached out to all of you to discuss which games you’d like to be involved in, and they’ll do their best to accommodate everyone when possible. Details of venues, addresses and match start times will be confirmed by captains ahead of each game. If you’re in any doubt, just drop them a line. A final reminder – only players who have paid their membership, and are ECF-registered, are eligible to play league games for Hammersmith. If you want to get involved please ensure you have both of these sorted in time, else captains will be unable to pick you! Get set… it’s going to be a great season! 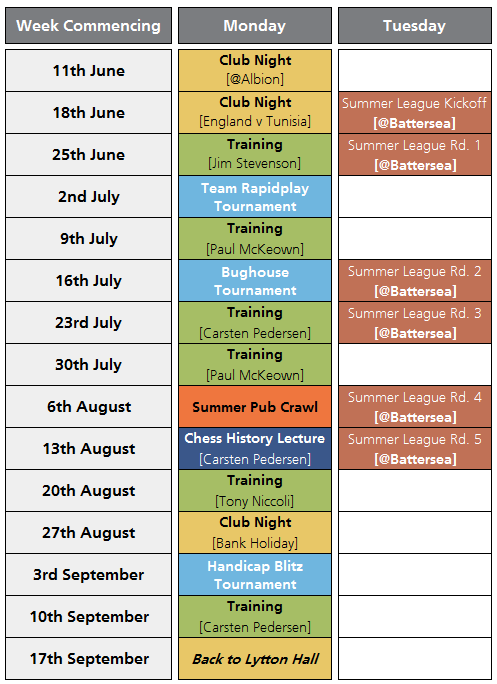 Author HammerPosted on September 19, 2018 September 19, 2018 Categories Club Updates, Games, General ChessLeave a comment on 2018-19 Fixtures are OUT! Definitely one of the results of the round. 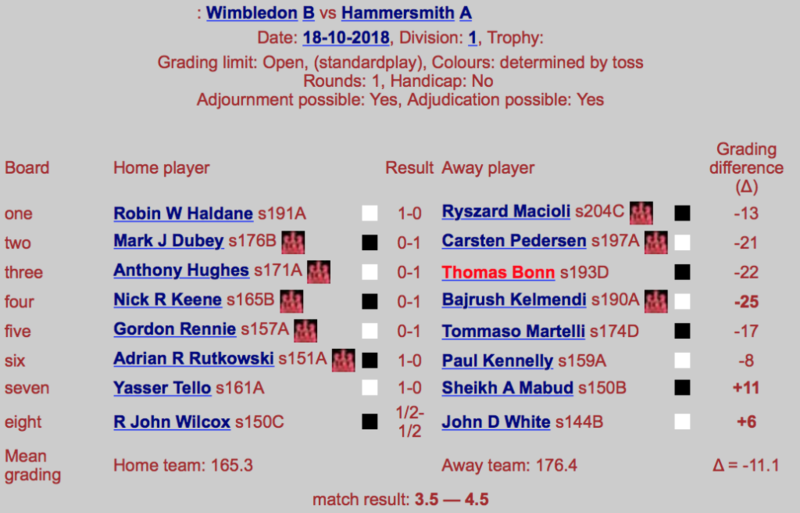 The IM was playing for Battersea in the open division as we saw a heavyweight clash finish 2-2 , with no fewer than 5 players rated over ECF 200. The competition continues with Round III taking place this coming Tuesday 24th July. Top player Carsten Pedersen hosts a FREE training evening tomorrow night at the Albion – starting 7.30pm. Everybody’s welcome – spread the word!